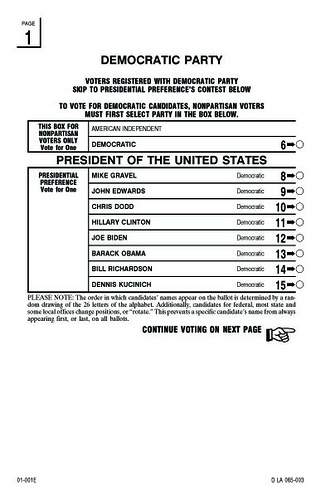 Ballot used in California on Super Tuesday. Irregularities in California Ballot Spell “Double Trouble”. First, the good news: In the days leading up to Super Tuesday, people-powered activism made it possible for the Courage Campaign to contact 1.1 million independent voters, which California calls “Decline to State” (DTS) because they decline to state a party affiliation. These contacts constituted about one-third of the 3 million total DTS voters in California. We informed these voters about their right to vote in Tuesday's Democratic Party presidential primary, by declaring a party at the time they appeared to vote. The bad news? Because of a ballot design problem, optical scanners did not count presidential preference ballots in the Democratic Party, if a DTS voter did not blacken the “bubble” to select the Democratic Party on the Democratic Ballot. No explicit instruction was written for voters to explain this restriction before the ballot was completed and scanned. Typical of voter despair were stories like Julian H.
"I've been following politics before I even hit my teens. And two weeks before this election, I turned 18, with my registration in weeks before. I knew the issues, the candidates, the propositions, and for the fist time in my life cast a ballot. I heard the next day about the double bubble. No one at the polls mentioned it, and I didn't see instructions that even pointed to its existence. It's not such a great feeling that you're first close up experience in a system you've watched for so long at a distance could have amounted to nothing." The weekend before the election, lawyers for the Courage Campaign uncovered the "double bubble" problem -- a shocking requirement that "Decline-to-State" voters fill in a redundant "Democratic" bubble (on a ballot clearly marked "Democratic Party") as well as a bubble next to their preferred presidential candidate. Our legal team realized that -- without the "Democratic" bubble filled in -- the county's optical scanners would void votes for "President of the United States," regardless of voter intent. On Monday morning, 24 hours before polls opened, we sent a letter from our lawyer to the Los Angeles Registrar of Voters, threatening legal action if the Registrar did not rectify the ballot problem before the primary. Unfortunately, on Election Day, polling places across Los Angeles erupted as the votes of DTS voters were rejected, even though almost every one of these voters clearly intended to vote for either Barack Obama or Hillary Clinton. Had we not warned Dean Logan and the press on Monday, the numbers of disenfranchised voters could have been significantly higher. As a result of our threatened legal action, the Associated Press, New York Times, Los Angeles Times, San Francisco Chronicle, and several TV and radio stations jumped on the issue immediately and Logan issued a public service announcement and last-minute directions to poll workers. But now Mr. Logan refuses to physically recount every vote cast by "Decline-to-State" voters. In what the media is now calling "Double Bubble Trouble," 94,000 "Decline-to-State" votes in Los Angeles County -- 50% of the total DTS ballots cast -- were rejected, despite the Courage Campaign's official notification to the Registrar prior to Election Day. Unfortunately, Dean Logan, the Registrar in charge of Los Angeles County, refuses to conduct a physical hand-count of every "Decline-to-State" vote before the official vote is certified. Every vote must be counted. And time is running out. We don't know if this "Double Bubble Trouble" will change the number of delegates that either Hillary Clinton or Barack Obama will receive. But we do know that we need to protect voter rights, increase voter confidence in our elections system, and prevent this from ever happening again. We live in a democracy in which every vote is supposed to count. But, in Los Angeles on Tuesday, the votes of almost 100,000 Decline-to-State voters were rejected because they didn't fill in redundant bubble. We know Secretary Debra Bowen is paying attention. And we have friends in Los Angeles who are focused on this issue as well-- like Eric Garcetti, President of the Los Angeles City Council, and Supervisor Zev Yaroslavsky -- but they need your help. With hearings being set up by State Senator Dean Florez and the eyes of California voters converging on Los Angeles County, there's no time to waste. Courage Campaign is a California based voter activist group. Rick Jacobs is its chairman.